Description: dark ambient project from Estonia. Hand painted covers on special paper, every copy is unique! Recorded in "Caverns of No Return" fall of Autumn, rise of Winter anno 2001. Bonus tracks recorded in 2002. All instruments, vocals, ideas by Thonolan 1996-2001. 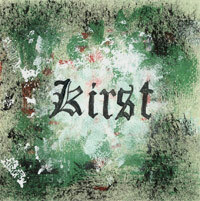 All music, lyrics written for Kirst by Thonolan. Finaly after seven years this weird project gets to official release. Back in 2001 only some burned cdr versions were made and found their way to some "real diehard fans".